Although never as successful as its HBO gangster predecessor, the Boardwalk Empire finale is the best concluding television finale since its HBO sibling cut to an ambiguous black in The Sopranos nearly seven years ago. Ascending from the ranks of David Chase’s number two on that previous show to show runner of Boardwalk, Terrence Winter devised a series—exemplified in the finale—that commented not only on the nature of the gangsters populating this specific period in Prohibition, but whose sins would trickle down to later generations of Americans as imbued in Tony Soprano at large. Though shows like Breaking Bad, True Detective, etc., remain masterpieces in their own right, Boardwalk’s ultimate sixty minutes demonstrated to devastating effect its mastery of long-term setups, own contextual history within the genre, and themes that illumine the dark nature of these particular-Prohibition gangsters through a beautiful collusion of storytelling. As will be seen repeatedly, the opening shot of the finale works on multiple levels of setup and payoff in both narrative and theme. 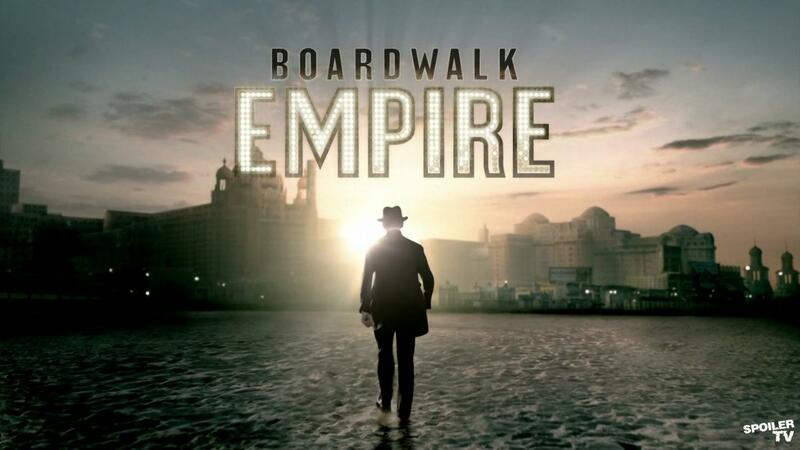 Cleverly eschewing the opening credits segment, Nucky’s clothes are crumpled on the beach—their owner swimming out past the ocean’s surf line— and away from the eponymous Boardwalk in contrast to the opening title bottles that always threatened to drown him toward it. The next sequence wraps up Al Capone within an unbelievably poignant, human glimpse into perhaps the most legendary gangsters seen throughout the series. Following a scene of his usual fist-pumping bravado and outward ignorance of his arrest, Capone returns home to confront his son. Unlike almost every other iteration of the man, the real estate of television allows for a heartbreaking look into one of America’s most infamous gangsters. Calling back to an earlier episode teaching his deaf son to fight, Capone shares a final conversation with his disabled son—aided by sign language that he’s clearly been practicing over the years—and begs for Sonny to make something of himself. The veneer of bravado melting, and adding with shades of Walter White logic, that his crimes were for Sonny’s well-being and that “that can’t be for nothin’”. 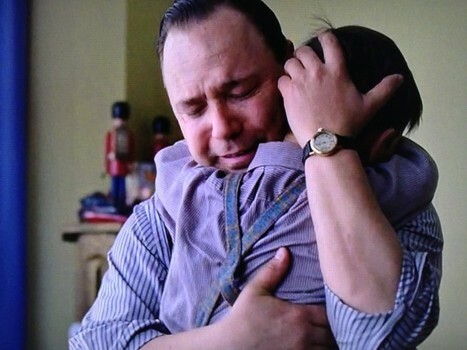 The deaf son then raises his fists in a tragic payoff to that earlier scene; but instead, Capone—a man so far apparently incapable of responding to bad news of any kind without violence—crumbles in his son’s arms for a final hug goodbye. A bit later on the boardwalk, a beautiful woman proclaiming to be from the future leads Nucky into a dark room to show him an early version of television. The scene drips with tension due the mislead of the New York gangsters announcing minutes earlier that they would murder their “friend” in public, but a more thematic tension arises from the eeriness of the newfound technology represented in the television. As the figurehead in a series depicting the archetypal gangster—the type to wear a pin-striped suit and a red carnation upon his lapel every day—a more haunting dread arises out of watching Nucky watching this revolutionary technology in an America that he will not be a part of moving forward. The television will soon become a mainstay in the American household—one that will eventually lead to a narrative television revolution depicted in The Sopranos built on de-constructing the type of gangsters that were established by Nucky, Capone, and Luciano—those initial godfathers to organized crime, who found their outlet and catalyst to build their empires through Prohibition. “Keep going until you can’t turn back. That’s where…there isn’t any choice…you don’t know where that is, you can’t know, until you pass it”. Meanwhile in New York, Luciano, Lansky, and Siegel have assembled the major mob figures that will form the Commission. Earlier in the episode, Luciano reminisces on his time with Nucky and Jim Colosimo—not so subtly reminding viewers of his incredible ascension to the top of the organized crime food chain. Alluding to King Arthur, Luciano notes that their meeting table is round, signifying a new equality amongst the mobsters. 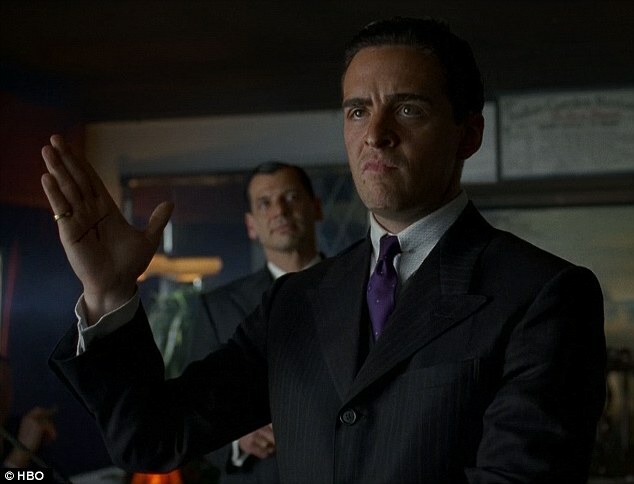 Despite his total destruction of Nucky’s Boardwalk empire, Luciano and the Commission are now moving in more ambitious terms—disavowing heritage squabbles (amongst white-looking gangsters at least) and intending to form a true empire of organized crime on a national level. With Capone is heading to jail and Nucky to the grave, the Commission—led by these once young crooks into future criminal kings—signals the end of the Prohibition gangster. Gangsters no longer slaves to the heritage of their ancestors—the Sicilian, Jewish, or Irish gangsters intent on dominating the other—nor the “half-a-gangster” represented by Nucky, Rothstein, and the Commodore in their constant battle between being a powerful public figure yet more powerful gangster behind closed doors—but an American gangster. Yet, Nucky’s ultimate fate returns to where it both began and will soon end—with Gillian. In another unbelievably heartbreaking scene, Nucky visits the source of his original sin and subsequent downfall. While fighting back tears in his speech, Gillian remains distracted by a ladybug. It’s worth noting that Gillian wears a pink dress with black dots, not unlike the insect upon her fingers. The viewer wonders whether she is ignoring him, confused, or waiting for him to finish…until the ladybug finally flies away. 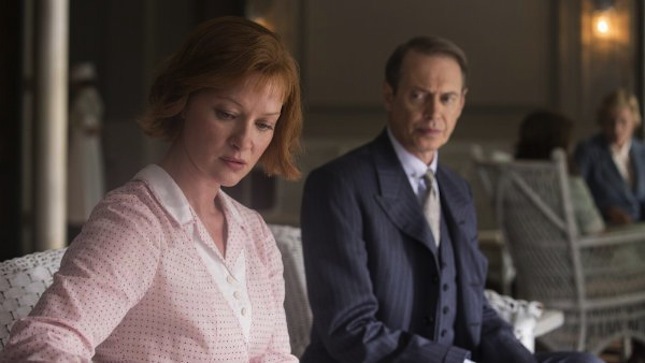 She tries to stand, but grips her stomach in pain—meaning that Nucky is too late, as Gillian has already met with Dr. Cotton, effectively sealing both their fates. 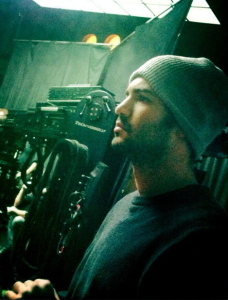 “You think you deserve something…for trying hard…What are you in the end anyway? The correlation between these lines is remarkable—an astounding commentary both on Nucky’s nature and that of the American ideology. 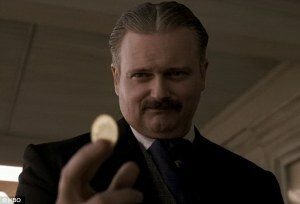 Paraphrasing much of this as though responsive of one another: “You don’t know how to be good…you think you deserve something for trying hard…I am what I need to be”—all ultimately answered in the form of money explains everything about Nucky’s character—a man believing that through an ethic of hard work and his deserving of money that his destiny can best be answered. 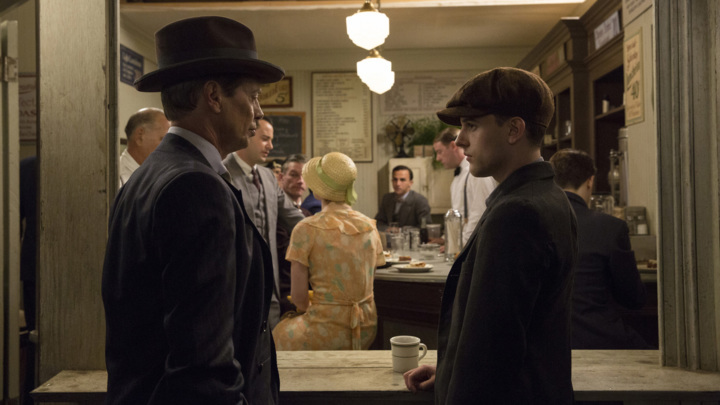 “Joe” subsequently reveals his true identity—Tommy Darmondy, son of Jimmy Darmondy, and grandson of Gillian—and fires upon Nucky. As the sound distorts into something incomprehensible and murky—like the sound of drowning—Nucky’s final flashback resorts to his days as a youth and the opening shot of the season. 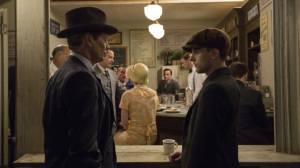 In that shot, Nucky was unable to catch the coin, which motivates his never ending hunger for the “nickel…and then the dime…and the quarter”, as he explained to Margaret earlier in the episode, but the series ends with his finally being able to seize the gold. In doing so, he has done everything described in the above: he has fought for the gold, hurled his youth into the grave, came out with a fortune, and finally—dying beneath the boardwalk that he’s built but that no one will remember his name for leaving behind—realized that the gold was not all. His death—coupled by Rothstein’s death, Capone’s arrest, and the construction of Luciano’s Commission—signals the end of the early days of organized crime. These were men, who believed that through hard work and the unique opportunity presented by Prohibition, that they deserved the gold. But ultimately, these were men of the past. Men who wanted to be good, but did not know how, their morals guided instead by a nightmare version of the American dream ahead. Though Luciano and the Commission would ultimately usurp them, the seeds of organized crime that flourished Prohibition would be passed down for many generations to come. Nucky’s legacy in the pursuit of gold will only be remembered as a footnote in the grander narrative of organized crime, along with his moral compass in being “what I need to be”, as American marches forward without him. And as Narcisse portentously remarks to his Harlem congregation before his assassination: “One generation passeth away, another generation cometh, but the earth abideth forever”. This entry was posted in TV Talk on October 29, 2014 by Nick Yarborough.